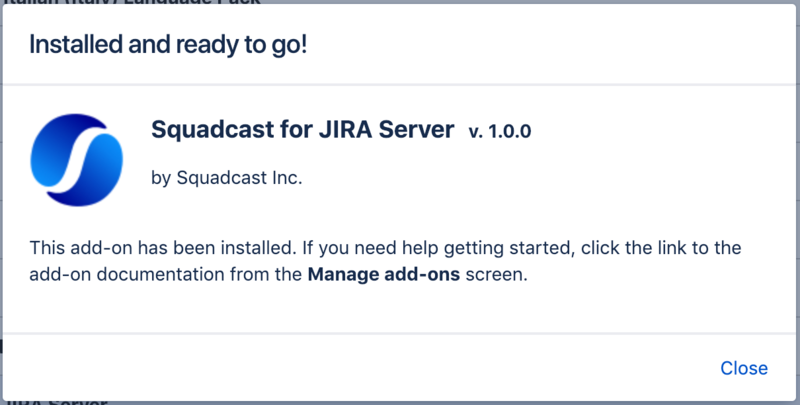 You can use this integration guide to install and configure the Squadcast extension in JIRA Server (On-Premise) in order to automatically create issues in JIRA projects when there is an incident in Squadcast and sync the status bidirectionally. You should have JIRA Server (On-Premise) version installed on your machine with a publicly accessible URL. An user account in JIRA Server with Administrator privileges. Base URL must be set in JIRA settings and it must be publicly accessible as mentioned above. 2. In the Add-ons page, search for Squadcast for JIRA Server Add-on and install it or alternatively upload the add-on JAR file directly from the Manage Add-ons section and wait for some time for the add-on to finish installing. 3. Inside your Squadcast dashboard, go to Integrations tab and click on Integrate button under the JIRA Server card. 5. Inside your JIRA server Add-ons page, select Manage Add-ons and scroll down to Squadcast and click on Configure button. 6. Paste the integration key obtained from step 4 and click Integrate button. 7. 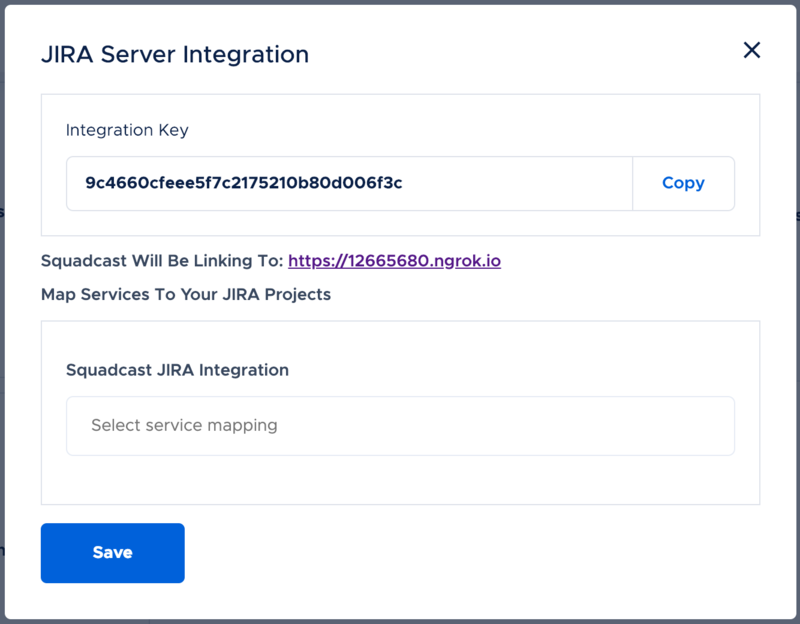 Go back to Squadcast JIRA Integration and click Check connection button and if the integration is successful, you will be able to see the JIRA URL and the JIRA Projects. 8. Now select which service(s) you want to associate with the project, and select the issue type, and map the Squadcast Incident status to that of the Issue status in JIRA and click on Save. That's it! Your JIRA Server Integration is good to go and whenever there is an issue triggered in Squadcast for the mapped service(s), an issue will be automatically created in the corresponding JIRA project and the statuses of the Squadcast Incident and JIRA Issue will be automatically synced as per the mapping we have done earlier. Note: If the Squadcast incident reaches either Resolved or Suppressed status, the bidirectional status syncing will stop even if the issue is re-opened in JIRA, as these both are end states in Squadcast.